Have The Yogarden Delivered directly to your door! Have	The Yogarden	delivered to you, anywhere on Koh Samui! For only 100 baht! The Yogarden is proud to bring you nourishment from the heart. Our café aims to feed your mind, body and soul though the healthy ingredients and recipes created by us. Yogarden creativeness in the kitchen has become well known throughout the island community and we are honored to share our passion for beautiful, delicious, nourishing food. The menu is as tasty as it is healthy and all ingredients are fresh and locally sourced where possible. Our smoothies, Juices and drinks are made from scratch and with love. The kitchen menu is listed on the board and daily specials will provide a tantalizing chance to sample new creations depending on the seasons offerings of fruits and vegetables. Please treat yourself to the benefits of a wellness through the art of healthy food. Sit back, relax, read and recline in our indoor café or café garden and surrender to bliss. Again, welcome to The Yogarden. Chopped Cucumber, onions, tomatoes and sprinkled with a helping of quinoa and dressed with lemon dressing. 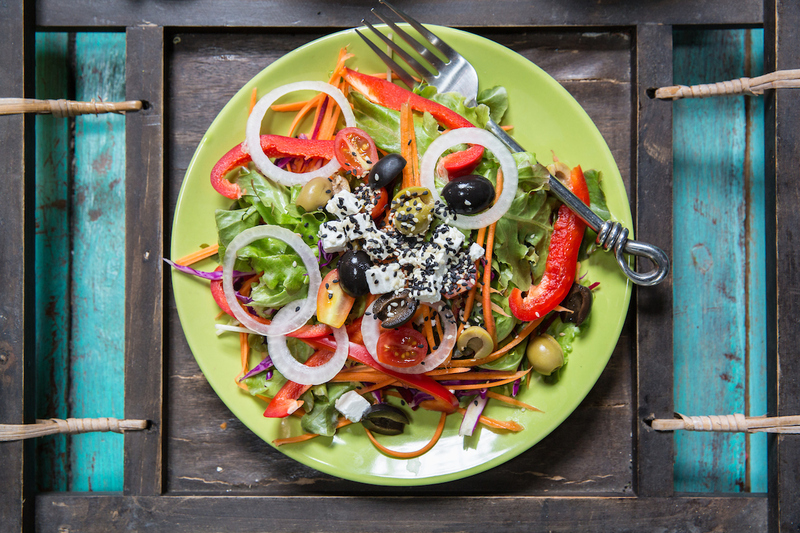 Big leafy green salad, packed with veggies, onions, olives and feta cheese and served with fresh brown bread. Your Choice of dressing. Fresh Watermelon chopped with sprouts and a heaping of raw seeds, feta and topped with balsamic dressing. Southern healthy version of Thai Green curry. Packed with fresh vegetables and served with organic brown rice. Delicious Curry from the North of Thailand. Noodle based with pumpkin and vegetables mixed with a helping of onions and pickles and crispy noodles to top. Dark organic brown rice and a big helping of mixed vegetables cooked in coconut oil. Raw fresh vegetables served with homemade Hummus dip and topped with taste of Cheynne pepper and seeds. Brown bread side. Celery, carrot and vegetables mixed with fresh homemade hummus in a tortilla wrap. 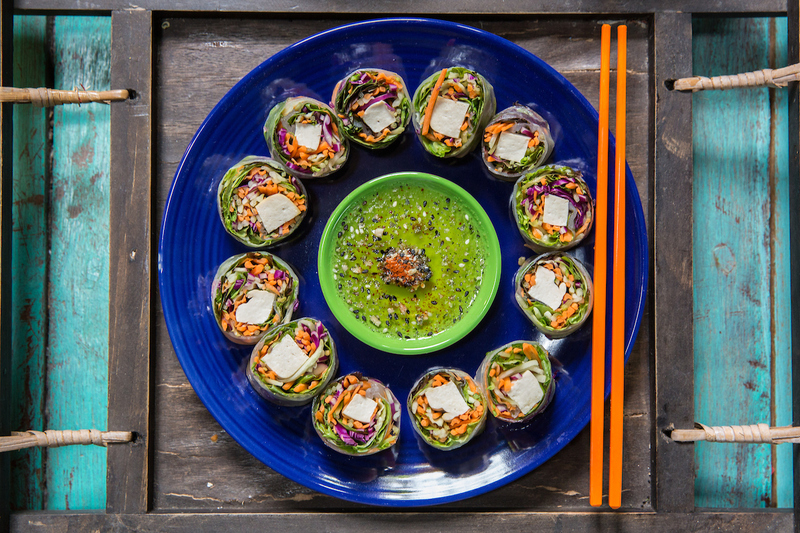 Fresh leafy greens and vegetables in a fresh rice paper wrap, served with either Tofu or Feta cheese. Fresh Apple, Broccoli and Celery pressed in slow juicer. Fresh Apple, Tumeric powder and ginger made in slow pressed juicer. Fresh Carrot, Apple and fresh Ginger pressed in slow juicer. Fresh selection of kale, broccoli, cucumber, corriander, celery and wheatgrass sweetened with green apple. Fresh Pineapple, corriander and ginger made in cold press juicer. Fresh pineapple, beetroot and carrot slow pressed in juicer. Noodles salad with Japanese vegan noodles,carrot,cucumber with a light mix peanut sauce served with vegetables salad and sesame sauce on the side.